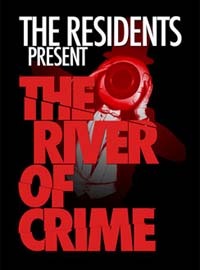 The Residents’ River of Crime is a character driven podcast series of shows, based on the time honored concept of true crime. Rooted in 1940’s style radio drama, The River of Crime not only updates the original form with modern production values, but also heavily leans on a distinctive soundtrack as one of its primary dramatic devices. A modern day Dragnet, the series follows the reminisces of its unseen narrator as he discloses a lifelong obsession with wickedness and vice. But, as opposed to the ironic and terse Joe Friday, a classic crime solver, The River of Crime’s narrator is a crime collector. After an early fascination with the electric chair, the series’ protagonist soon finds himself completely absorbed by the idea of crime and criminals, and each episode unfolds as a personal recollection, a memory of some unlawful event that has affected his life. Within the series these events are recreated as drama, interviews and narration, interrupted and supported by a strong musical score. Not unlike a butterfly or stamp collector, the narrator initially feels a controlled distance from his subjects, gleaning tidbits of information from every possible source, while filling countless notebooks with newspaper clippings, thoughts and personal observations – life is an endless collection of the odd and unlawful. For him crime has become the artform of the sociopath, a curious combination of creativity and antisocial behavior ...and he is its curator. But then one day, everything changes and, unexpectedly, a crime comes to him ...then another ...and another. At first he’s charmed by this turn of events, and while he continues to pursue his own unlawful interests, one crime after another seemingly falls into his lap. But, as the frequency of these events grows more rapid, so does their danger, as well as their proximity to the storyteller, whose touch with reality appears more fleeting with each close encounter. Adrift in a sinking ship, he’s lost on The River of Crime.